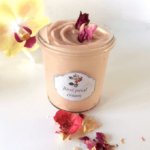 These DIY rose scented bath bombs enhanced with roses and essential oil will moisturize your body, make you relaxed and will enable you to enjoy yourself fully again. There are times in our life when you feel that life is headed in a different direction than you want it to. And these are the moments when one tries to involve the senses as much as possible. Listen to pleasant music, listen to the bird’s singing, cook something good, enjoy the beauty of nature or just take a nice relaxing bath. Immersing your body in the water is very relaxing, helps reduce tension, headaches, cramps and makes you feel good about yourself once again. 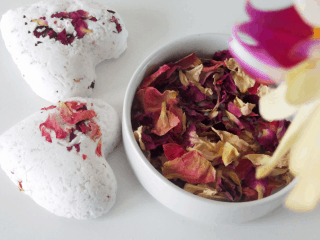 What better way to enhance this feeling by making your very own DIY bath bombs. and these can all fit into one tiny bath bomb! 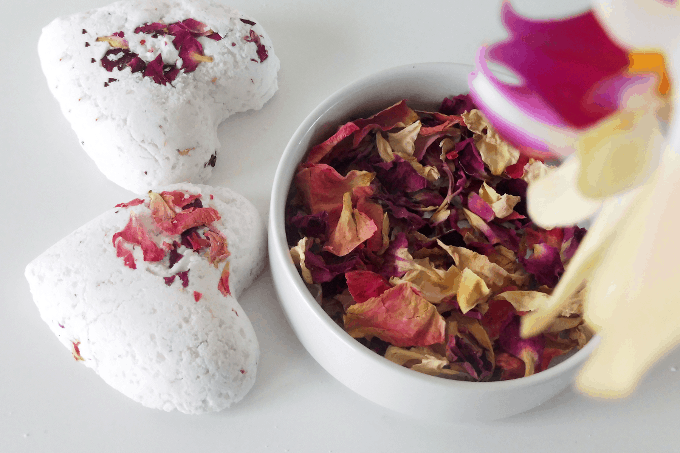 This DIY rose bath bomb recipe contains all natural ingredients enhanced by rose petals and rose essential oil. Roses not only provide nice decoration to your bath and give it a nice romantic touch but they also enhance your skin and mood. They have a smooth harmonizing effect on all skin types, including children and allergy sufferers. 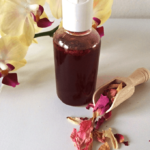 Rose’s healing properties and their regenerative effects have been observed for centuries. Thanks to their ability to neutralize free radicals and therefore slow the aging process Roses are very often used in cosmetics. 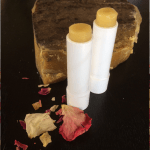 Rose essential oil is one of the most luxurious and expensive out of all essential oils as 1 g of oil requires 2 thousand roses. With coconut oil, Epson salt, baking soda, and citric acid these DIY bath bombs are easy to make and are ideal to soothe your skin, relieve tension and send all your worries away. In case you don’t have a bath but still, want to pamper yourself try these Cardamon Rose bath salts. They are easy to make and your toes will never feel better. If you want to turn this bath into a romantic setting, spread the rose petals around your bathroom or sprinkle them on the water surface. Add some rose water and/or rose-infused oil to intensify the effect. Don’t forget to prepare nice and relaxing music and a maybe even a glass of wine or champagne. 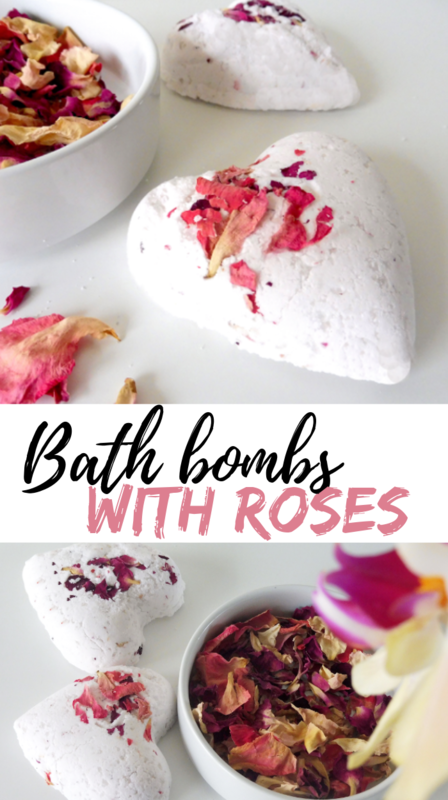 This DIY rose bath bomb recipe is easy to make and also makes for a nice homemade gift for your loved ones. Why are my bath bombs soft? When you feel that your bath bombs are a little soft, you probably used more wet ingredients than needed, either too much witch hazel, rose water or ethanol. No worries! compensate it with a little extra cornstarch that will make the bath bombs harder and more sturdy. To make sure that the mixture’s balance is adequate and that the bombs will hold together, make a test. Roll a ball and let it fall from 20 cm. If the ball holds together, the mixture is ready. If it doesn’t hold together try to add a little more of the wet ingredients. Take a look at the video to see the test in action. What natural colors to use for coloring? We used a bit of rose water to create a pink color. When you add water ingredients into the mixture, you may see some fizz happening already, but that is okay. just don’t put too much. To avoid this you can use natural colorants in the form of powder instead like beet root powder. Slowly pour in the coconut oil rose essential oil. Whisk it well. Add rose water to color - you may see some fizz happening already, but that is okay. just don't put too much. Test the moisture of the mixture by grabbing a handful and squeezing. If a clump is formed which holds together somewhat it should be moist enough to mold. If you need to add a little water, then add more if needed. Take a look at the video. Fill the mixture into the bath bomb molds and allow to set for about one hour. 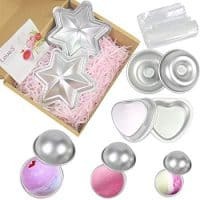 Carefully remove the bath bombs from the molds and wrap them for later. 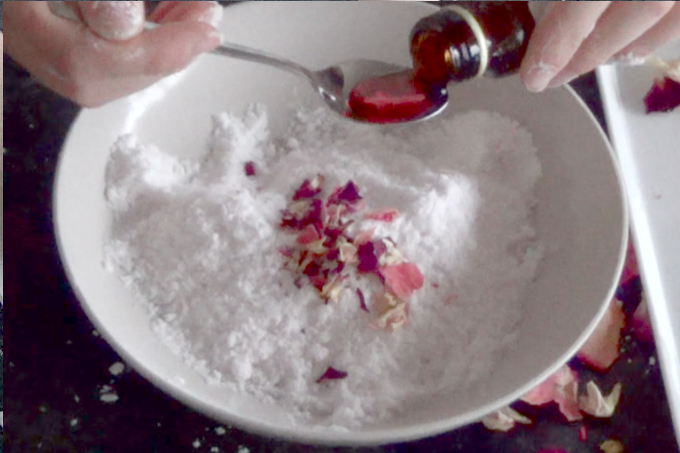 Other natural colorant then rose water is beet root powder, which make them pink. These are beautiful! What a great self-care gift or “galintines” 🙂 ! I am a big DIYer, but I have never done bath bombs. Now that I see how easy they can be, they are on my list! My teen girls have really gotten into bath bombs lately and they love anything with roses – very girly and sweet! Thank you for the tutorial – I think I can just let them follow your steps and they can do it themselves. Aww these are too cute and perfect for valentines! Will have to try and make them!! !